One of my player collections if of former USC Trojan and NBA Slam Dunk Champion Harold Miner. As I have shared before, I was at school at USC during Miner's three years and lived on the same floor as him during my sophomore year. We interacted occasionally and actually played a little hoops together. Not friends but friendly. I have been collecting his cards since he entered the NBA and my collection of his cards is about as complete as any player collection I have. My want list is primarily some obscure parallels from his playing days and a few low numbered recent cards of his that Upper Deck put out during a nice stretch where they produced some really nice hoops cards of players in their college unis. 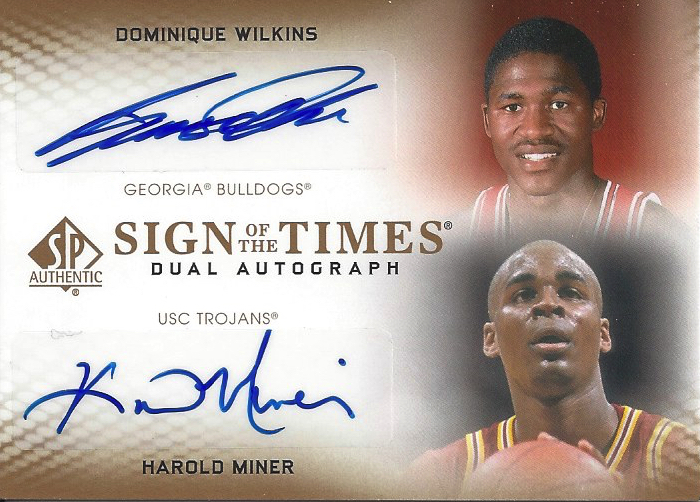 Harold is paired on this 2012-13 SP Authentic card with fellow Slam Dunk champion and Hall of Famer Dominique Wilkins. While I do get excited when I can remove one of the playing days Miner's from my want list and really enjoy picking up low numbered parallels from recent releases, this was my second greatest want for my collection. My sights are set on a triple autograph with these two guys and Spud Webb. Interesting neither of these cards is serial numbered but based on scarcity out on the open market, I have to assume they are fairly limited. I plan on keeping my eyes open for more Miner cards that I need but expect that this will most likely be the only card of his I add to my collection this year. Very cool. I remember the days of getting excited pulling a Baby Jordan from a pack.